While Ryanair Holidays does not hold a license form the Commission of Aviation regulation, Ryanair School Travel Ltd allowed its travel agency license 0766 to expire on October 31. Re-launched in late 2016, the carrier at the time said Ryanair Holidays was part of a plan to position itself as the ‘Amazon of travel’. Following its re-launch, the service was taken offline at end of January 2017. The airline blamed the then decision on “illegal screenscraping and mis-selling” of flights by the company powering it, LogiTravel. The initial Ryanair holidays was formed in partnership with Patricia Roselló, a close associate of Paul Evans of Lowcostbeds whose collapse cost the Irish Travel Trade €4m in 2016. Following a change of accommodation partner, Ryanair Holidays had been operational in Britain, Germany, Ireland, Italy and Spain,. 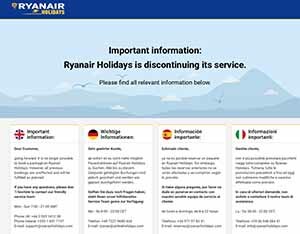 going forward, it is no longer possible to book a package on Ryanair Holidays. However, all previous bookings are unaffected and will be fulfilled as planned. Writing in 2016, Travel Extra said:The launch of Ryanair Holidays was pitched as the airline’s move to become the Amazon of travel. 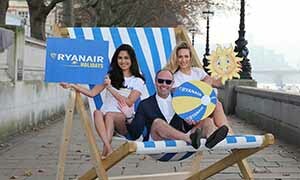 Kenny Jacobs told guests that Ryanair is prepared to invest its commission on holidays to optimise conversion and growth of the sector, they would bringing down package holiday prices by 10pc. Ryanair threw not one, but TWO, Spaniards into the works. The bed banks, to which Ryanair awarded the tender were surprising both in the lack of scale and the scope of their operation. Tomeu Benassar‘s Logitravel is well known in Ireland as third biggest outbound operator from Spain. World2meet is headed up by the wife of Paul Evans, who was chasing the Ryanair accommodation contract as CEO of Lowcost Beds before it went so spectacularly pear shaped last July and stormed the Irish travel industry for €4m. Last December Patricia Roselló moved from Lowcostholidays to the NT incoming and New Travellers companies which had been acquired by the Iberostar group where she helped launch its new brand World2meet at Fitur in Madrid in January. She was joined by Mark Nueschen, former CEO of Global Met and previously in Hotelbeds. The group turned over €250m in 2015 in 15 holiday destinations in Spain. It distributes its products through 10,000 travel agencies in Spain with a substantial portfolio in the Middle East and Thailand. To add to the puzzle Logitravel are licenced for just 11,560 passengers from England. Ryanair drive a notoriously hard bargain, and previous accommodation contracts have ended up in dispute. Once penalty clauses kick in for not reaching targets the Ryanair website can be a very lonely place to have your brand. No doubt Benassar and Roselló are well aware of this. Ryanair has a licence from the Commission of Aviation Regulation by the school’s group business which was an early signal that something bigger might be afoot. Traditional Irish tour operators have been wary of airlines who dabble in their market. Selling package holidays is a complex business and complexity has not been Ryanair’s forte in the past. See launch coverage here.